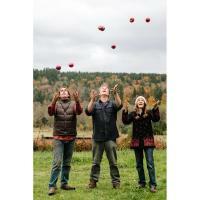 Finnriver is an organic family farm and artisan Cidery located on 33 acres along a salmon stream in Chimacum, on Washington's Olympic Peninsula. Here, we grow mixed produce and grains to offer at local Farmer's Markets, select stores and through our CSA farmshare program. We also gather and ferment the flavors of the land to offer you our handcrafted sparkling hard ciders, fruit wines and liqueurs. Our on-farm Tasting Room and seasonal Farmstand are open for tours, tastes and purchase. Tasting Room hours vary by the season and can be found at www.finnriver.com We are inspired to make hard cider, wines and spirits by the allure of the fruit, the ancient history of the craft, and the lively traditions of fermenting from the old world and new. Finnriver is committed to sustainable land stewardship through conservation easements, renewable energy, salmon-safe certification, habitat restoration and community outreach.